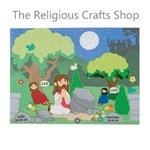 Easter Sticker Scene - Thomas Believes Jesus. 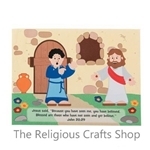 A great addition to Sunday School supplies and activities, especially in the first few weeks after Easter, these scenes can help teach children about believing in and having faith in what they cannot see and prove. This allows children to make their own individual scene to take take home. There are 12 background sheets and 12 sticker sheets. Finished product measures 16cm by 12cm. 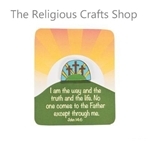 Religious Pack of 50 Cross Stickers. This is an essential for Sunday Schools. 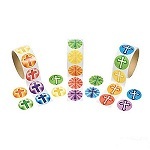 Christian cross stickers come in a range of designs and colours. Design sent will be one of the designs shown. Stickers measure 3.5cm. 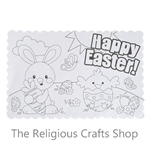 Easter 12 Pack of Colour Your Own Sticker Scenes. This is an activity children will love. They can colour in both the sticker characters and background scene and make them unique and special to them. Then they can have the fun of peeling the stickers and arranging them on the backgrounds. Background sheet is large, 28cm by 22cm, with twelve stickers ranging in size from 5cm to 11cm. 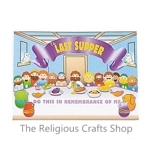 Pack of 12 Easter Placemats. This is a great activity for younger children who will have lots of fun colouring in their placemat, and can then have it at the table for Easter parties etc. Placemats are large in size, 42cm by 30cm, and have pretty scalloped edging. 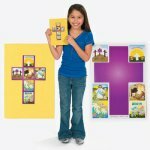 Christian 12 Pack of Make an Easter Cross scene Stickers. 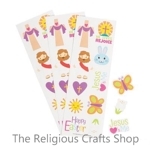 These stickers are ideal for Sunday Schools and celebrate the importance of Easter in the Christian calendar. Sticker sheet measures 16cm by 12cm. 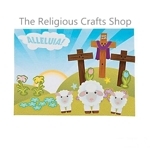 Make an Easter Scene 12 pack. 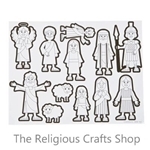 This is an easy craft for children - they can draw their own picture and add these stickers, or simply stick the stickers in their own design on paper. Stickers measure approximately 2cm - 9cm. 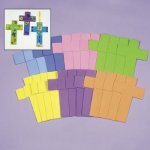 Pack of 6 Large Foam Crosses. 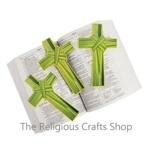 Use these crosses to create your own crafts. Easy to decorate with gems and stickers on our site. 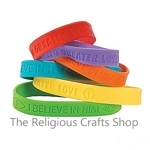 Each pack has 6 different coloured crosses and measure 20cm by 14cm. Sunday School 12 pack. 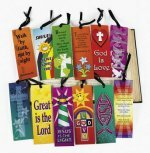 A great gift for Sunday schools and Bible classes. The cross is made of wood and measures approximately 4cm, attached to a nylon cord. 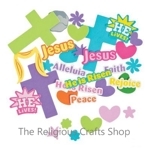 Pack of 50 'Christ is Risen' Stickers. 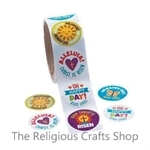 Perfect for Easter activities, these stickers are colourful with inspirational Easter messages. Stickers measure approximately 4cm.